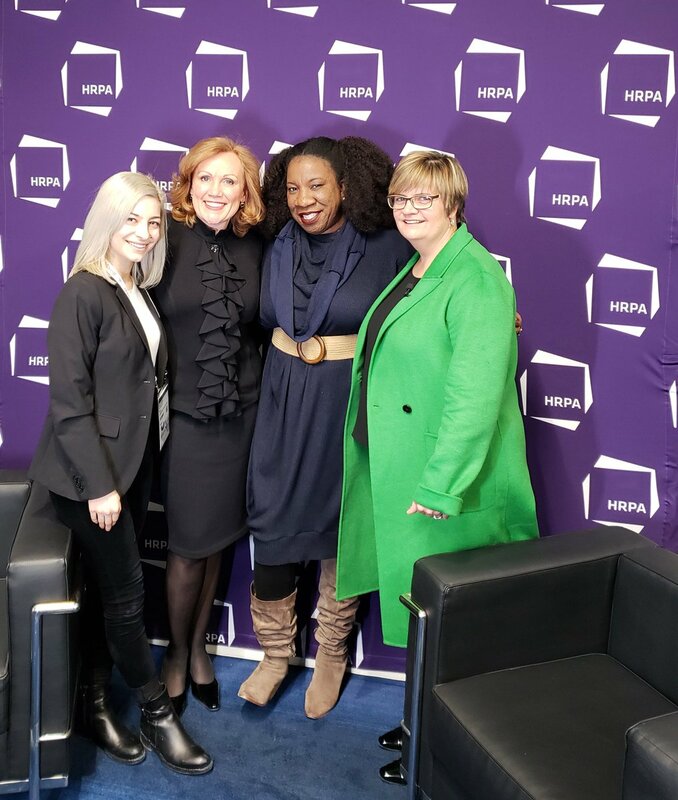 Alexia Kapralos (left), Canadian HR Reporter's videographer; with Louise Taylor Green, CEO of HRPA; Tarana Burke, the originator of #MeToo and the morning keynote speaker; and Karen Stone, chair of the board of directors for HRPA. TORONTO – Filling your boardroom with women and minorities sounds like a great idea, but don’t mistake it as a solution for diversity and harassment issues in the workplace. That was the message from Tarana Burke — the originator of the #MeToo slogan that sparked a global movement. Burke, the opening keynote speaker at the 2019 HRPA Conference and Tradeshow, had a frank and entertaining discussion with the 2,500 professionals gathered at the Metro Toronto Convention Centre. She told the tale of a time she was on a yacht, off the coast of Cannes, France, with the CEO of a Fortune 100 company. He was bragging to her about how many women he had hired and moved into positions of power. To his shock, she told him that wasn’t going to fix anything. Women, after all, can be guilty of the same offences as men – including patriarchy and misdeeds. In a passionate wide-ranging speech, she called on leaders not to be lazy in driving for change to eliminate sexual harassment and mistreatment of women. She bemoaned recent stories about men in leadership roles refusing to mentor women because of fears of being in one-on-one situations. But she also called on women to own their behaviour and also not be inappropriate at work. She discussed the recent viral Gillette campaign that called upon men to do better, and was puzzled by the severe backlash among men about the message. “The backlash was strange to me,” she said. Men need to set aside their sensitivities and be able to hear these things. But by the same token, she called on men to be given space to be vulnerable and for women to also hear them out. “This is what I was raised not knowing,” a man might say, and he should be given the space to discuss that and have women hear him out. “Everyone has to be a genuine part of the conversation,” she said. Burke, the original “silence breaker,” was among the group named Time magazine’s Person of the Year for 2017. And she is convinced real change will come to workplaces. She talked about airplanes, and how it wasn’t that long ago that you could smoke. You could light up in offices, workplaces and restaurants — almost anywhere you liked, she said. But then evidence started coming out about the dangers of second-hand smoke. Burke’s dream for the workplace is for it to be a safe place. Where everyone can come and do their jobs — regardless of whether they love the gig or not. It was a great gauntlet to throw at the feet of HR professionals to kick off the first day of the largest HR conference in Canada.